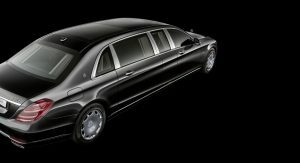 After updating the S-Class last month, Mercedes-Maybach has now focused its attention on its stretched sibling, the Pullman. 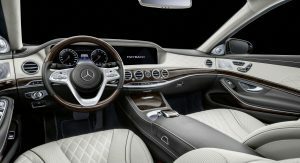 The luxury car now features a new front grille, which was previewed by the Vision Mercedes-Maybach 6 Concept, a couple of years ago. It also gets 20-inch wheels, with a 10-hole design, and more exterior colors to choose from, including two-tone finishes. 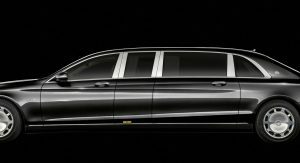 Inside its 6.5-meter (21.3ft) long body, the 2019 Mercedes-Maybach Pullman can be had with new exclusive colors. The list includes Magma Grey, Mahogany Brown and Silk Beige/Deep Sea Blue. 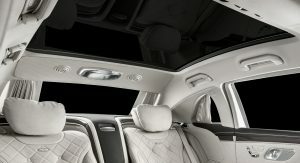 A front-view camera is also available, which allows passengers in the rear compartment to monitor the traffic in front, even with the partition screen closed. 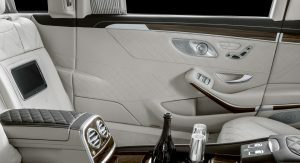 They can also benefit from independent music control thanks to the ‘2 cabin sound’ system. 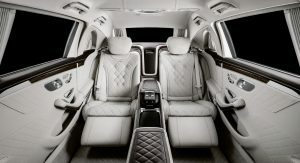 And speaking of occupants, the vehicle can sit four in the rear, on individual seats, facing each other and enjoying what the company calls “the largest legroom in the segment”. 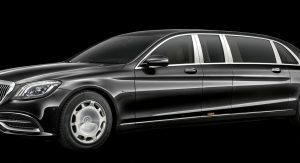 Unlike its predecessor, which is called S600, the 2019 Mercedes-Maybach Pullman has received the S650 badge. 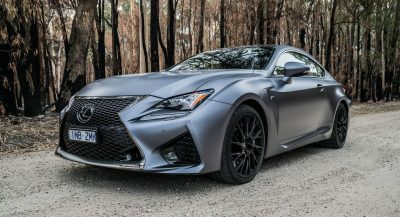 Its twin-turbo 6.0-liter V12 engine now makes 630PS (621hp) and 1,000Nm (738lb-ft) of torque, a 100PS (99hp) and 170Nm (125lb-ft) increase. 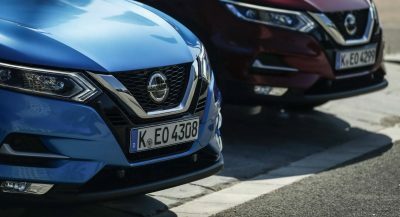 Naught to 100km/h (0-62mph) takes 6.5 seconds, and it burns 14.6 l/100 km (19.3 UK mpg / 16.1 US mpg) of fuel, on average, while emitting 330 g/km of CO2. 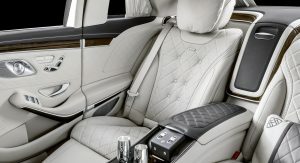 Mercedes-Maybach has already started taking orders for the updated Pullman, and prices start at approximately €500,000 ($619,000) in Germany. The ‘Guard’ armored variant is expected to follow shortly. Oligarchs, Dictators, Fascists and Vulgarians rejoice! Not as lame as you following me around the internet, replying to my comments with petty insults. Shouldn’t you be over at 9to5mac, impressing everyone with your blind devotion to Apple? Awww….look at how mad you are. Does it make you super angry that I made fun of your idiotic comment? It’s ok, you can whine like a baby just like you do on 9to5mac. No, I just find it amusing that you came to a website you’ve never commented on before to make a fool of yourself in front of a whole new batch of commenters. For someone who purports to be so tech savvy, you’re surprisingly easy to troll. LOL!!! I find it amusing that you came to an Apple website to essentially declare your insecurity and lack of intelligence. The awkward anger and dissatisfaction you confess. As if Apple has violated physicals. The uproar and angst that you exhibit are hilarious to watch. And I keep egging you on and you keep professing your insecurities. Nope, I went to your site to express my agreement that Apple deserves its giant tumble in a reputation poll for their shady dealings. I don’t blame you for attacking me, though. You Apple apologists are already on edge when anything negative about your “ecosystem” is criticized. You still haven’t explained why you decided to follow me to a completely unrelated car site, though. Did I make you THAT mad? Like I said earlier, I also comment on the Washing Post site. Are you mad enough at me to purchase a subscription so you can criticize my comments there, too? A big licorice jelly bean. A jelly bean with 621hp mind you. If Chrysler had something similar it would make a great Imperial. Lots of power, class, elegance – it would really help elevate the brand. A jelly bean Imperial? Please. NO! But yes – a Hellcat powered Imperial would be incredible. 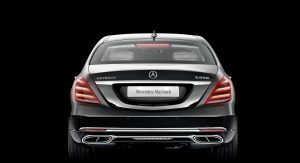 [And give it an 86 hp advantage over that Maybach!] Seriously though. Think about it. A 200 mph Imperial. 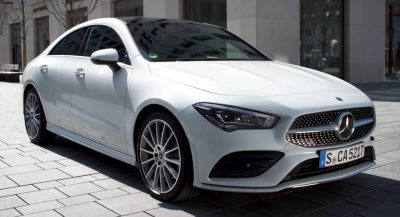 Would that NOT compete well and good against the CT6 and Continental? Although how brilliant this car is, it will never compete with Rolls Royce. True, but the thing is, some people just think R-R is too vulgar. Mercedes has so many nice wheels available and they give their top-of-the-line “S-Class” these ugly and bland wheels. WHY!? I like them, they are very understated. I know plenty of people who agree. Otherwise luckily you can opt for one of their other choices. Maybe I buy that in 2030, for 80.000 €. Gas powered cars might be banned by then. THE FRONT END REFRESH DOES SEPARATE IT A BIT FROM THE STANDARD S CLASS. INTERESTING THE REPEATER IN THE ROCKER PANEL MID-SHIP.